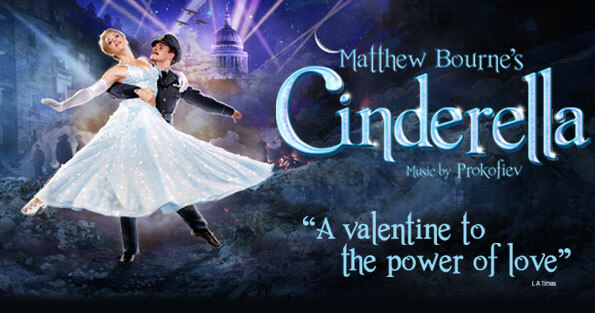 The return of Matthew Bourne’s retelling of Cinderella has been met with great enthusiasm and a sold out run. Rightly so – his decision to set it during the London Blitz adds an extra level of depth and real emotion. The set is wonderfully evocative of wartime London, the colour palette dreary, the costumes full of the elegance of the age. Prokofiev’s famous score is interspersed with air attack sirens and the sound of bombs falling. It seamlessly fits into its new setting, perhaps reflecting the influence of the time of its creation on the composer. The final act, in a traditional ballet a glittering celebration, is instead subdued – the couple are reunited in a convalescence home and their wedding is transplanted to a railway station amid the reunion of couples and separation of others as more soldiers head to war. It is an appropriately understated affair that is nonetheless heartening. The ball scene is a triumph. It opens heartwrenchingly on an already bombed Café du Paris, bodies litter the floor, the glamour of the place stripped away in its rubble. The Angel (our Fairy Godmother equivalent) appears and the destruction reverses, the simple beauty of a wartime dance brought to life. The reminder of how fleeting life became weighs heavily as the revelers reanimate. Cinderella makes her entrance in a flowing white ballgown, the envy of all, and dances the night away before heading to bed with her newfound love. This feels very modern compared to the more innocent traditional tellings and highlights the awareness of the ephemerality of love in such uncertain times. Cinderella’s transformation from a downtrodden, ordinary young woman to an elegant blonde bombshell is beautifully realised but her return to normality and the fact of her husband’s war damage gives a sense of reality to the story. The Angel, in his shiny silver suit, dances with ethereal lightness, a pleasure to watch. An utter triumph of a retelling that fits so neatly with such a well-known tale. If you want a more grown-up version then this historic version is not one to miss. Sold out for the rest of its run at Sadler’s Wells, it is worth travelling to catch it on its tour of the UK.